764 pages of the first volume of "United States Army and Navy Journal and Gazette of the Regular and Volunteer Forces." Sometimes called "Army and Navy Journal" or "Armed Forces Journal," these 48 issues date from August 29, 1863 to August 20, 1864. The Army and Navy Journal was the nation's leading military journal of the time. This collection includes issues number 1 through 22, 24 through 33, and 37 through 52. A significant aspect of the developing military professionalism that came as an outgrowth of the Civil War was the founding of professional associations and journals. Notable among them were the United States Naval Institute, founded in 1873, whose publication "Proceedings" would become well known; the United States Cavalry Association, which published the Cavalry Journal; and the Association of Military Surgeons, which published The Military Surgeon. In 1892 the Artillery School at Fort Monroe founded The Journal of the United States Artillery; and in 1893 a group of officers at Fort Leavenworth founded the Infantry Society, which became the United States Infantry Association the following year and later published the Infantry Journal. In 1879, United Service began publication as a journal of naval and military affairs. 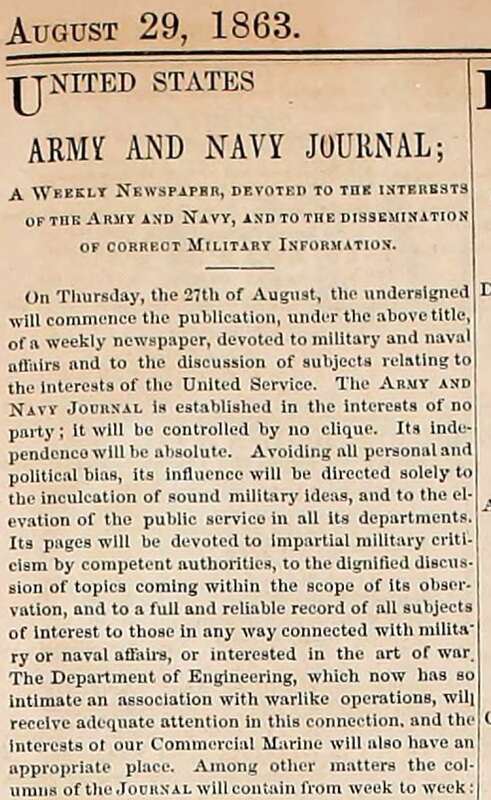 Still earlier, in 1863, the Army and Navy Journal, as it came to be called, began a long run. According to military historian Richard W. Stewart, it was not just a professional journal like the others mentioned. The Army and Navy Journal, along with its social and other items about service personnel, carried articles, correspondence, and news of interest to military people that helped bind its readers together in a common professional fraternity. The Army and Navy Journal and Gazette of the Regular and Volunteer Forces was founded by the brothers Francis Pharcellus Church and William Conant Church. William assisted his father who edited and published the New York Chronicle. In 1860, William became publisher of the New York Sun. In 1861, he became the Washington correspondent for the New York Times. In 1862, he was appointed a captain in the United States Volunteers and served for one year. In 1871, William along with George Wood Wingate founded the National Rifle Association (NRA). In 1872, he replaced its first president, the retired General Ambrose Burnside. Francis Church covered the Civil War as a reporter for the New York Times and the Sun. While lead editorial writer at the Sun in 1897, Francis wrote one of the most famous editorials in American history. In response to a letter written to the Sun by eight-year-old Virginia O'Hanlon asking whether Santa Claus really existed, Francis wrote an editorial titled, "Yes, Virginia, there is a Santa Claus." 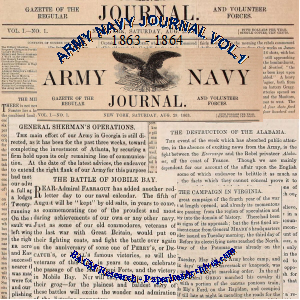 The Army and Navy Journal and Gazette first date of issue was August 29, 1863. The first issue of the weekly newspaper carried the motto, "Established in obedience to an insistent demand for an official organ for members of the American Defense and those concerned with it." 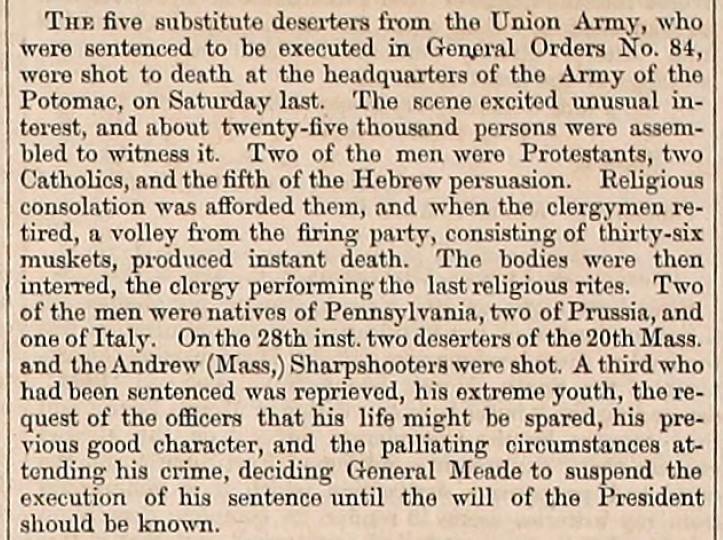 In addition to major Civil War events, the Army Navy Journal covered stories of courts martial, obituaries, official dispatches from the War Department, appointments, list of AWOLs, foreign military matters, editorials and advertisements. The Journal included reprints of articles from Confederate publications. Southern newspapers including the Greensboro Journal, Richmond Dispatch, Richmond Enquirer, Richmond Sentinel and Atlanta Constitutionist. In its first issue the Army and Navy Journal promised in addition to the top military events, to provide coverage of "1st. Full official lists of all appointments, promotions, changes of station, deaths, resignations, dismissals, and other changes in the personnel of the two services. 2d. A full and reliable record of all active operations by the Army and Navy. 3d. A summary of all official orders proper for publication. 4th. A full account of the operations of the Coast Survey and the Revenue Service, and of all changes among the officers of these two departments. 5th. Changes in the medical department of the two services, with matters relating to military hygiene, surgery and the sanitary condition of the Army and Navy. 6th. Descriptions of inventions and improvements relating to the Art of War, and of experiments and discoveries illustrative of military science in this country and abroad. 7th. Narratives of military and naval exploits and adventures; correspondence from members of the two services. Answers to questions in regard to difficult or disputed tactical matters, or other subjects suggested by correspondents. 8th. An account of important movements of foreign armies and navies, with notices of changes in the personnel of the services of foreign nations. 9th. Criticisms upon current literature and art, of interest to the Army and Navy. 10th. Articles upon military and naval engineering. 11th. Station of the naval vessels in commission; report of Navy Yards, and movements of foreign naval vessels. 12th. Editorial discussions upon subjects of interest to our soldiers and sailors." 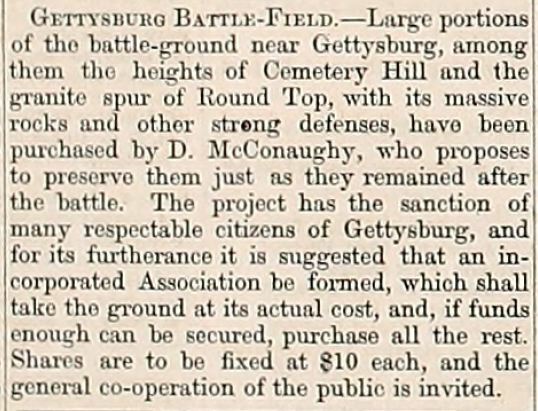 The Battle at Gettysburg took place two months before the first issue of the Army Navy Journal. Events related to the aftermath for this battle is covered in the first few issues of the journal. General George Meade Virginia operations. 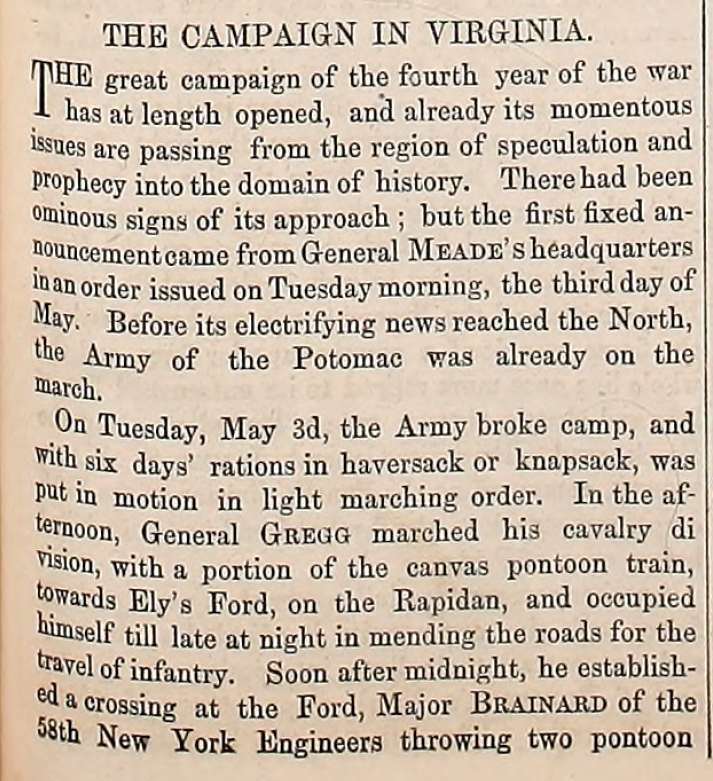 From August 1863 through November 1863, General Meade led several cautious and inconclusive movements through Virginia. Battle of Chickamauga Creek, September 19, 1863. Fought at the Tennessee-Georgia border near Chickamauga Creek, Confederate forces under General Braxton Bragg defeated Union forces, forcing the Union Army of the Cumberland under General William Rosecrans to retreat to Chattanooga. The battle of Chickamauga Creek resulted in 34,444 casualties. Battle of Chattanooga, November 23-25, 1863. After Rosecrans's loss at Chickamauga, Confederate General Braxton Bragg's army occupied the mountains surrounding Chattanooga. Grant was brought in to re-organize the Army of the Cumberland. Through actions including the storming of Lookout Mountain on November 24 and the Battle of Missionary Ridge on November 25, Grant was able to break the Confederate blockade of the city. Bragg moved his army into Georgia. The victory allowed Sherman to use Chattanooga as the base for the Atlanta Campaign and the union advancement into the heart of the Confederacy. Lieutenant General Ulysses S. Grant on March 10, 1864, was given command of all of the armies of the United States. Grant's Wilderness Campaign May-June, 1864. Commander of the Union armies, General Grant seeking to shatter Lee's forces in Virginia planned to engage them until they were destroyed. The Battle of the Wilderness, Virginia, the opening battle of the "Overland Campaign" or "Wilderness Campaign" lasted three days. The battle was inconclusive. Grant suffered more casualties then Lee, however unlike Grant, Lee he had no replacements. The Battle of the Wilderness in Virginia is the first of a bloody series of engagements between Grant and Lee. The Battle of Cold Harbor, May 31 to June 12, 1864. General Grant chose to attack Confederate forces at Cold Harbor, resulting in the loss of over 7,000 of his men in twenty minutes in the frontal assault against the well fortified positions of Lee's army. According to author Edward Bonekemper, Union casualties and losses totaled 12,737 with 1,844 killed, 9,077 wounded, and 1,816 captured or missing. Confederate losses totaled 4,595, with 83 killed, 3,380 wounded, 1,132 captured or missing. Lee's victory came at heavy cost to his shrinking army. It was the last conclusive victory of the war for Lee. June 19, 1864, the USS Kearsarge sinks the CSS Alabama off Cherbourg, France, where the Confederate raider was bound for refitting. July 11, 1864, Confederate troops under the command of General Jubal Early travel through Maryland. Early got within five miles of Washington and fired upon the northern defenses of D.C. On July 13 Union forces drove Early back into Virginia. The Battle of Mobile Bay, August 5, 1864. 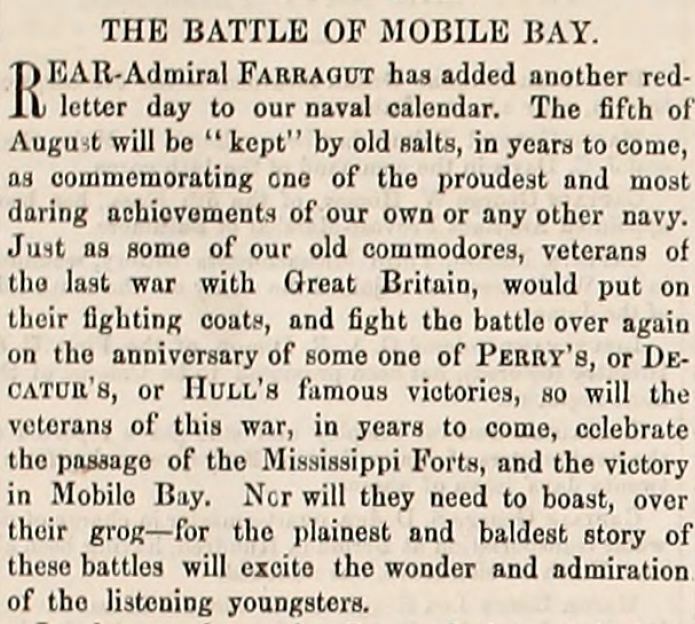 A Federal fleet commanded by Rear Adm. David G. Farragut, attacked a Confederate fleet led by Adm. Franklin Buchanan and three forts that guarded the entrance to Mobile Bay. August 1864, General William T. Sherman's Atlanta Campaign is launched when Sherman's forces depart Chattanooga.